Andrew’s friend, Shane McCauley, has published a new collection of poetry, titled Ghost Catcher. The collection has been published by Studio magazine, which has given its entire 125th edition to showcase Shane’s poetry. 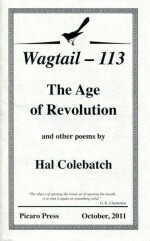 Andrew’s friend, Hal Colebatch, has published a new collection of poetry, The Age of Revolution. Consisting of 20 poems, the 16 page chapbook is part of Picaro Press’s Wagtail series. The publisher claims that “a major objective of the [Wagtail] series is to keep enough good work in print for readers to form a considered opinion of each poet’s voice and style”. 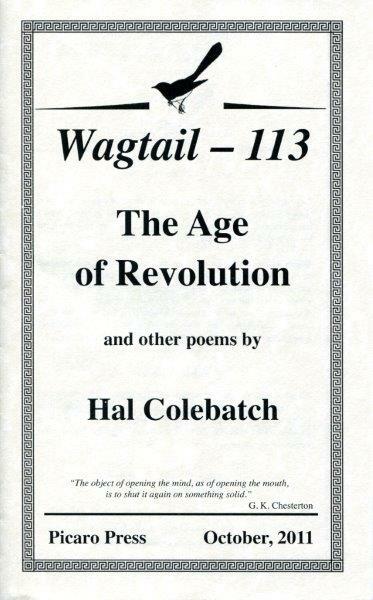 Certainly, The Age of Revolution offers a fine sampling of Colebatch’s poetic voice and style. Andrew has won the Caleb Prize for Poetry for the second year in a row. He has been awarded the 2012 Prize for his book, Allsorts: Poetry Tricks and Treats. Andrew was joint winner of the Caleb Prize for Poetry in 2011 for his book, Far from Home. the birds or their migrations. of the hurtling eight-lane highway. charting their way south for winter. pulling at the loadstone of my heart. Andrew read at the Perth Poetry Club today (Saturday, 24th November). He was one of two invited readers and he read poems from his collections Far From Home and Two Poets. 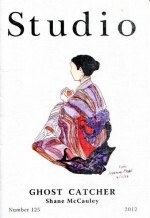 Quadrant magazine has published three of Andrew’s poems in its November 2012 issue – “The Solace of the Stilt”, “Sand-Bathing” and “Perceptions”. Read the rest of Lisa’s comments about Andrew’s collection, The Colour of Life, in Two Poets here. 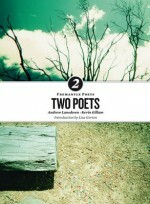 Two Poets retails for $24.95 and can be purchased from Fremantle Press here or from Penguin Books Australia here. Les Murray’s recent anthology, The Quadrant Book of Poetry, contains many fine poems, including one by Peter Kocan about Dylan Thomas and his wife, Caitlin. Read Peter’s poem, “Dylan & Caitlin” in the Favourite Poems section of Andrew’s website, here. To my mind Australia’s finest poet. No-one handles imagery as deftly. I read Boat one of the poems from this collection and my favourite poem of many of his, to my writing group the other Saturday. Listening to it produced some interesting poems of our own. Lansdown’s poems are the ones I go back to repeatedly and reread. They remind me what poetry is. Several of Andrew’s poems have been included in the latest issue of Axon journal – a series of four tanka under the title “Birds, Perching” and another tanka titled “Absence”. The first print run of Andrew’s poetry collection for children and young people, Allsorts: poetry tricks and treats, was sold out earlier this year. Wombat Books has now reprinted the book, which can be ordered through this website or from Wombat Books or from bookshops. The reprinted edition of Allsorts contains some minor alterations to the text and half a dozen new illustrations by Susan Lansdown, Andrew’s wife. For a short time, Allsorts is available through this website post free, a saving of over $6.00. If you would like to purchase a copy of Allsorts for $24.95 email contactandrew[at]andrewlansdown[dot]com. Two Poets (Fremantle Press, 2011, 228 pp) features the work of two poets – Andrew Lansdown and Kevin Gillam. Andrew’s contribution, a 98-poem collection titled The Colour of Life, comprises the first half of the book. Read more about Two Poets on this website here. Andrew’s poem “Who Gives This Woman” has been published in the latest edition of the beautifully produced, book-style magazine Famous Reporter (# 43, June 2012). Allsorts offers all sorts of poetic treats, for adults and children, including haikus, limericks, short and longer poems in a variety of forms, all in Lansdown’s inimitable style; often amusing and always celebratory of the natural world. There are delightful black and white illustrations by Susan Lansdown and a major final section including a q and a where Lansdown discusses his ‘poetry ideas’, and a list of definitions of poetic techniques and forms. As an introduction to the pleasures as well as the discipline of reading and writing poetry for young and older readers this book could not be bettered. Earlier this year, the online journal Creatrix invited Andrew to submit several haiku for inclusion in a special “invitation only” section. Those haiku – three of them – have now been published in Creatrix, issue 17, June 2012. To read Andrew’s other two haiku, go to the Creatrix website: http://creatrix.wapoets.net.au/2012/06/issue-17-haiku/ and scroll down to the section headed “The following haiku are by special invitation from renowned national and international haikuists”. 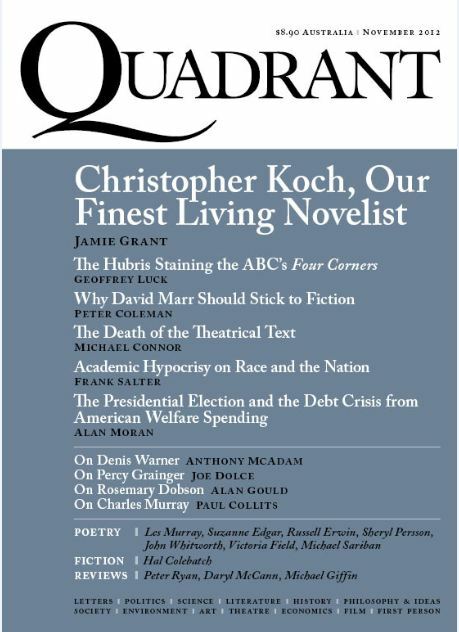 The esteemed Australian poet and anthologist Les Murray has compiled a collection of the best poems published in Quadrant magazine in the last ten years. Les Murray has included 12 of Andrew’s poems in the anthology, which is titled The Quadrant Book of Poetry 2001 – 2010 (ISBN 9780980677867). 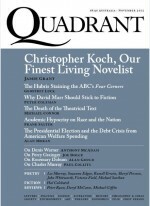 From the second decade of his twenty years as literary editor of Quadrant, Les Murray here presents a selection of the best verse he published between 2001 and 2010. It is a prodigious body of work: 487 poems by 169 authors. Andrew’s poems in The Quadrant Book of Poetry 2001-2010 are: “Two Pictures of Hurt”, “After Pain”, “Dandelion Haiku”, “Distress”, “Wrens in Wire”, “Freedom”, “The Sleep of the Upright”, “Caress”, “Hop”, “Flag”, “Sighting”, “After Death”. How foolishly I once thought of freedom. of fatherhood hung upon me like chains. from home—and I am enslaved by loss. as if it had made the kill. In February and March Andrew ran poetry workshops at two venues and read poetry at a third. On 25th February he read a poem and discussed his book Two Poets (with Kevin Gillam) at the Perth Writers Festival breakfast organised by Fremantle Press and held at the Western Australian University. On 10th March he ran an Advanced Poetry Workshop on “Alternative Poetic Forms” at the Peter Cowan Writers Centre. On 23rd – 25th March he ran three workshops and participated in a discussion panel on “Poetry and Music” at the 2012 Storylines Festival of Children’s and Young Adults’ Literature at All Saints College. 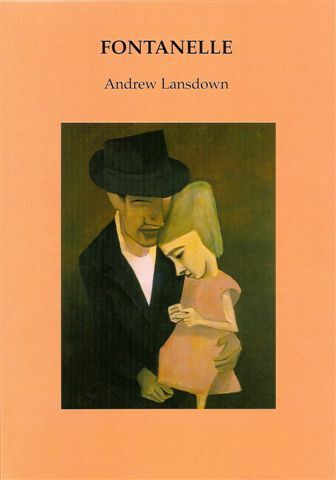 The National Library of Australia has published two of Andrew’s poems – “At the Close of Summers to Come” and “Caterpillars” – in an anthology titled Little Book of Butterflies (ISBN 9780642277404). The National Library of Australia has published poems by Andrew in two other anthologies: The Little Book of Trees and The Little Book of Cats, and has requested permission to use another of his poems in the forthcoming anthology, Little Book of Banksias. Fremantle Press has just published a book of Brian Simmonds’ paintings of the Swan River. The painter has chosen two of Andrew’s poems to accompany two of his paintings. The poem “Fishing” accompanies the painting “Fishing below Fremantle Traffic Bridge” while the poem “The Japanese Gardener” complements the painting “Freshwater Bay looking south-east toward Bicton”. at the line’s far-away end.